This Muskoka Luxury Waterfront Vacation Home is a great rental property as it offers winter activities such as: skiing at Hidden Valley which is 10 minutes away; snowmobiling; and ice fishing. This is a year round getaway! Spring and fall offers great hiking on the property because the property is 3 acres, and the fall colours of Muskoka are a huge tourist attraction especially for artists and professional photographers. The summer offers relaxing water activities and we provide to our guests a kayak, canoe, row boat and paddle boat for your enjoyment. These boats are great for fishing or exercise. There are several golf courses within 10-15 minute car ride. Our beautiful Luxury Home is well insulated and it is very warm and cozy with two sources of heating offering wonderful privacy and beautiful landscapes. Take time to relax with your partner and/or family. It is beautiful, romantic and tranquil. In the winter conveniently located near snowmobile trails. Snowmobiles are not included but easy to rent or better yet bring your own because the driveway is large enough that you will have ample room for parking your toys and trailers. There is a company close by that you can rent seadoos in the Spring, Summer and Fall. Great fishing, swimming, hunting and hiking! You and your family will not be disappointed with this Muskoka Luxury Waterfront home in the beautiful Town of Huntsville. 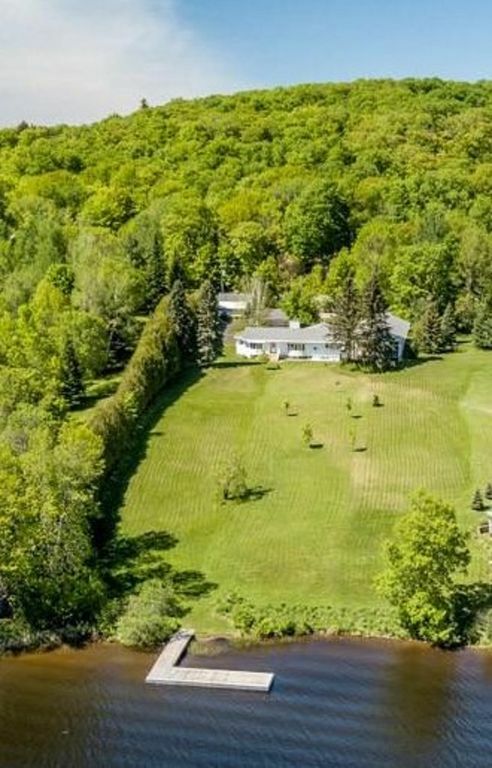 Located on a paved road with easy access from another major Highway 11. Only 2.5 hours from Toronto or 2 hours from York Region. * All linens provided. Our linens are new and high-end. Includes a fridge, stove, microwave, water cooler, shower, bathtub, outdoor fire pit, water filtration with UV purification system, and master bedroom overlooking the most beautiful lake. *All linens included for all beds. *We thought of everything for you and your guests to enjoy because we want you to return and return again and again! 1. No pets allowed because it is very clean. 4. Discounts for Medical Support Staff. 7. Repeat booking discounts for repeat guests. 8. No rental for persons under the age of 19 years. 9. Must have boaters license if you wish to drive any of the boats. 11. All guests must be able to swim and all children must have taken swimming lessons prior to your stay. 12. Noise restriction in effect after 11:00 p.m. I am a teacher. My husband is a doctor. My father is the maintenance man. Our daughter attends the University of Western Ontario in London, Ontario, Canada as a full-time student in Psychology. My husband and I are in the caring professions. We love having the same families come back year after year. Our number one goal is for your vacation to be the best it can be so that you return year after year. We offer great customer service because we believe in paying it forward. We upgrade our place every month so your visit is never the same. Each time you come back to stay you will see improvements to our beautiful luxury waterfront home. Large Library of over 100 books from a variety of genre. Feel free to leave a book behind as a donation to our Library. Please do not take any books!! We have adult and children's books! Large lawn area for tent. Large lawn area 3 acres for football game, or baseball game or soccer game. Please also bring your own bikes. For those that cycle as a sport we are on a paved road with a paved driveway. Perfect for your sport. Large boating area. Park your own boat at our large dock. Launch your boat 5 minutes away from our place. Beautiful large front deck with lots of patio furniture. Large dock with patio lounge chairs. Large selection of life jackets in a variety of sizes ranging from child sizes to adult sizes. You do not need to add chemicals because we already do it before you arrive! My family and I had a wonderful time. The property is very spacious and clean. We also had fun fishing, paddle boating and chilling in the hot tub. We will definitely come again. Thanks. This is a lovely home with lots of recreational options. Views from the house are amazing! The Fall weather was not conducive to water sports but we found plenty of other activities in the Huntsville and Muskoka Lakes area. We'd definitely come back another time for summer or winter play. We were a party of 6 adults and 6 kids (1yr. to 10yr olds) and stayed at this beautiful property at the end of September. It's an absolutely gorgeous location, the cottage interior is well maintained, amazingly clean, very nicely decorated and well furnished with all the amenities one could think of. The hot tub was a hit with the kids and adults alike. We will definitely come back next year!